Context: Due to increased incidence of late neurotoxicities associated with whole-brain radiotherapy (WBRT), the idea of treating limited brain metastasis (BM) (1–4) only with stereotactic radiosurgery (SRS) has become an interesting topic. Due to lack of SRS facilities, there is a major disagreement in the use of SRS in BMs. Aims: In our study, we tried to find out views and practice patterns of the Indian radiation oncologists (RO) on the use of SRS in BMs. Setting and Design: This is an internet-based, cross-sectional survey among ROs. Materials and Methods: Online questionnaires were sent to 411 RO through an online survey portal (SurveyMonkey®). Responses were analyzed. Results: Among which, 24.6% (101) responded completely. 39.6% were from teaching hospitals and 49.4% (48) were had <5 years of postspecialization experiences. About 38% (36) treats 30–100 BMs cases/month. Among the respondents who have SRS facilities (25.8%), only 26.1% use SRS routinely for BMs. Majorities (39.7%) have <3-year experiences. In oligometastases (1-4), 56.1% still practice WBRT only, though 57.6% feel that WBRT followed by SRS boost is the ideal treatment. 30.2% RO feels that local control is most important outcome determining factor for single metastasis, 40.9% RO feels the best modality is SRS alone. For treating >5 metastases, 92.1% ROs practice WBRT only. Conclusions: This is probably the first study on practice patterns of SRS in India if not the world. Major discordance exists between practice patterns and views on SRS use among RO in India. Majority do not practice SRS due to lack of facilities. Witnessing the rapid rise in popularity of SRS globally, we thought of assessing the patterns of practice of SRS among radiation oncologists (ROs) of India. According to AERB 2012 statistics, the total number of oncology centers in India with radiotherapy facilities is 319. Among all these centers, only 32 centers provide SRS facilities (including 5 cyberknife, 7 gamma knife, and 2 tomotherapy). Hence, this study will also reflect the opinions about SRS among ROs who have no access to such facility. This may be relevant to similar oncology centers in other developing and underdeveloped countries. We have conducted an internet survey-based, cross-sectional study among (RO) practicing in India, with the aim of finding out the practice patterns and their opinion regarding use of SRS in BM. Total study duration was 3 months (July 2016 to September 2016). Online were sent to 411 ROs practicing over India through online survey portal: SurveyMonkey (which is an online survey portal with the features of real-time results, text analysis, SPSS integration, custom reporting, etc.). The participants were asked to answer 26 questions including baseline information. The response was anonymous. The survey includes questions regarding availability of SRS facilities in their institutes, patient load, ratio of planning treatment time between SRS and EBRT, and their opinion for treating limited BM. The response of the survey was evaluated and results were analyzed. Questionnaires were sent to 411 RO. Total respondents were 24.6% (n = 101), among which 82.3% (82) responses were complete. Among all respondents (101) 33.6% (32) were from academic referral center. 39.6% (40) were from teaching hospitals, whereas 25.7% (26) were from nonteaching private hospitals and 1% (1) was from teaching private hospital. Among all (101), participants from Eastern India were maximum in number, that is, 39% (39) About 25% (25), 20% (20), and 16% (16) were from Northern, Western, and Southern part of the country, respectively. Among the respondents (100), 30.7% (31) were senior consultants/senior teachers, 30.7% (31) were junior consultants/junior teachers, and 38.6 (39%) were residents. About 49.5% (48) had <5 years' experience in this field, whereas, 33% (32),6.2% (6), and 11.4% (11) had 5–10 years, 10–20 years, and >20 years experiences, respectively. Among the respondents (96), 17.7% (17) said that new case registration/year in there is <1000. About 42.7% (41) participants have 1000–3000 new cases/year in their center, whereas 17.7% (17) and 21.9% (21) participants have 3000–5000 and >5000 cases registered/year, respectively. Nearly 25.3% (24) respondents have 10–30 BM cases/month in their radiotherapy department. 37.9% (36) have 30–100 cases and 36.8% (35) have >100 BM cases/month in their department. Among all respondents (90), 77.9% (70) respondents have standard neurosurgery facility, whereas 25.8% (23) have standard SRS facility in their hospitals. Among the respondents (23) who have SRS facilities only 26.1% (6) use SRS routinely for BM. Among all respondents (68), 35.3% (24) do not have any experience in SRS. 39.7% (27) have <3 years experiences, 11.8% (8) have 3–5 years of experience, and 13.2% (9) have >5 years experiences in SRS. Among all respondents (87), 28.7% have linear accelerator (LA) with frame, 39.1% (34) are using LA without frame, and 8% (7) are using gamma knife. Upon asking machine preferences, among all respondents (69), 37.7% (26) preferred LA without frame, 24.6% (17) prefer LA with frame, and 13% (9) preferred gamma knife. We asked about time ratio of SRS versus WBRT planning of BM at their department. Among all respondents (44), 25% (11) said it as 2:1, 18.1% (8) said 3:1, 13.6% (6) said its 4:1, and 15.9% (7) said its 5:1. Majority 27.1% (12) said it is >5.1. Among all respondents (64), 90.6% (58) have experiences in Cobalt 60 based WBRT in BM. All the responses related to questions about oligo-metastasis (es) are detailed in [Table 1]. We asked about the current treatment protocols for treating multiple (≥5) BMs. Among all respondents (63), 92.1% (58) said WBRT and 7.9% (5) said it is WBRT and SRS boost. Upon asking the key decision-making factor in multiple BMs, among all responses (58), 89.7% (52) said tumor volume burden and 10.3% (6) said it is the number of metastases foci. As discussed in the beginning, SRS has revolutionized the treatment of BM since the last decade. It has become so eagerly accepted by ROs all over the world that the century-old standard of care, namely WBRT, is now being questioned for its deleterious effect of neurocognitive outcome of BM patients, especially with increased survival of nearly all types of Stage IV cancer these days. The rationale behind this trend is chiefly because SRS offers a chance of cure in low-volume BM while WBRT is essentially a palliative treatment modality. In fact, two robust studies have proven that addition of SRS to WBRT can improve survival., The recent ASTRO trial went one step further showing that SRS alone renders improved survival in BM patients under 50 years of age in the absence of WBRT. Whether Indian ROs share the same enthusiasm as their global counterparts can only be gauged by knowing their perceptions, training exposure, and experience about SRS in clinical practice. This study aims to explore these areas to understand the current practice of SRS in India. The electronic module is an effective tool for conducting surveys in a resource-constrained setting. At the same time, there is the inherent drawback of poor response rate due to various reasons such as lack of time, apathy to share personal choices, especially on treatment decision-making, or simply poor access to internet facilities. For these reasons, only 24.6% ROs responded to this online survey. This is the usual response rate for surveys over E-mail. A similar survey conducted by Tata Memorial Centre, Mumbai, on stereotactic body radiotherapy also witnessed a response rate of 24%. Most (71.2%, 72) of the respondents were from academic referral centers and teaching hospitals, that is, government hospitals. This is an interesting finding because SRS facilities are more available in private setups than government institutions. The reason may be that academic environment is fostered relatively more in the latter which promotes interest in such survey studies. Geographically, there was not much variation in response rate, except from Eastern India which is because more ROs were personally known to the authors. Work tier did not influence the response rate much which is a sign that interest with SRS is quite unanimous. Relatively less (<5 years) experienced personnel responded more than others (5–10 years and >10 years). This may be due to multiple factors like younger generations were more enthusiastic than others, apathy, or bias against newer treatment modalities in more experienced personnel probably due to lack of long-term data on SRS, etc. About 25.3% (24) respondents have 10–30 BM cases/month in their radiotherapy department. 37.9% (36) have 30–100 cases and 36.8% (35) have >100 BM cases/month in their department. As for the incidence of BM, most (74.7%, 71) centers had >30 cases of BM/month. Nearly 26% centers had SRS facility which shows that most of our centers depend on neurosurgeons for treating SRS suitable BM too. However, as stated in beginning, 2012 statistics of AERB showed only 10% centers equipped with SRS facility. Hence, nearly 2.5-fold increase over the last 5 years proves the rapidly increasing popularity of SRS in India. More than one-third of respondents had no experience with SRS and about 13% ROs had significant (>5 years) experience. This again reflects the dearth of adequate training of ROs in SRS. Most of the respondents practicing SRS preferred linear accelerators (LAs) with frame as they are most commonly available in most centers. Dedicated gamma knife centers for stereotactic radiotherapy are infrequently present in India, so preference of the same was limited to only 13% respondents. Planning for SRS is quite time-consuming all though it is a one time job. Lack of training and infrastructure may have contributed to a nearly fivefold increase in time consumption as compared to WBRT planning in most SRS centers. Coming to treatment for oligometastases (<4), most ROs picked on addition of SRS to WBRT as their preferred choice. Local control and overall survival were voted to be the most important outcomes deciding the use of this combination therapy. On the other hand, the choice of WBRT vs. SRS was decided more by age and performance status than status of primary (controlled or progressing) and least by its histology. WBRT was the obvious choice for multiple (>5) metastases foci in >90% respondents. This practice pattern for oligomets is in line with the conclusions of the major RCTs on SRS.,,, Stockholm et al. conducted a similar survey to explore the practice patterns among ROs of USA for management of intracranial necrosis post SRS. Although the study aim was different, there are two major similarities with our study – most of the respondents were from academic centers and most of them used LINAC-based SRS systems. To sum up, our study reflects the eagerness with which ROs have incorporated SRS in their clinical practice notwithstanding the significantly unmet needs for SRS training and facilities in India. The infrastructural deficit can be addressed by government funding along with financial aid from international organizations such as IAEA (International Atomic Energy Agency). International collaboration on SRS training can help in technical training of ROs. Personnel exchange program, fellowships, workshops, sharing of institutional evidence on SRS can be of significant impact in this regard. All such steps will improve the awareness on SRS and motivate our ROs to enrich their experience on the same. Major discordance exists between practice patterns and views on SRS use among RO in India. Majority do not practice SRS due to lack of facilities. This is probably the first study on practice patterns of SRS in India if not the world. This will enlighten the perception of ROs on SRS. The information presented here can be used for discussion with neurosurgeons to build a SRS consortium in the near future. Such a consortium can chalk out policies on SRS and maintain a database for audit and formulating guidelines. We are thankful to all faculty members of Radiotherapy Department of Medica Cancer Hospital, Siliguri and R. G. Kar Medical College and Hospital, Kolkata, for their support. We also acknowledge all the respondents of this survey. We are also thankful to the management of Medica Cancer Hospital, Siliguri, for the financial support. Nayak L, Lee EQ, Wen PY. Epidemiology of brain metastases. Curr Oncol Rep 2012;14:48-54. Barnholtz-Sloan JS, Sloan AE, Davis FG, Vigneau FD, Lai P, Sawaya RE, et al. Incidence proportions of brain metastases in patients diagnosed (1973 to 2001) in the metropolitan Detroit cancer surveillance system. J Clin Oncol 2004;22:2865-72. Schouten LJ, Rutten J, Huveneers HA, Twijnstra A. Incidence of brain metastases in a cohort of patients with carcinoma of the breast, colon, kidney, and lung and melanoma. Cancer 2002;94:2698-705. Markesbery WR, Brooks WH, Gupta GD, Young AB. Treatment for patients with cerebral metastases. Arch Neurol 1978;35:754-6. Lagerwaard FJ, Levendag PC, Nowak PJ, Eijkenboom WM, Hanssens PE, Schmitz PI, et al. Identification of prognostic factors in patients with brain metastases: A review of 1292 patients. Int J Radiat Oncol Biol Phys 1999;43:795-803. Vecht CJ, Haaxma-Reiche H, Noordijk EM, Padberg GW, Voormolen JH, Hoekstra FH, et al. Treatment of single brain metastasis: Radiotherapy alone or combined with neurosurgery? Ann Neurol 1993;33:583-90. Egawa S, Tukiyama I, Akine Y, Kajiura Y, Yanagawa S, Watai K, et al. Radiotherapy of brain metastases. Int J Radiat Oncol Biol Phys 1986;12:1621-5. Horton J, Baxter DH, Olson KB. The management of metastases to the brain by irradiation and corticosteroids. Am J Roentgenol Radium Ther Nucl Med 1971;111:334-6. Baumert BG, Rutten I, Dehing-Oberije C, Twijnstra A, Dirx MJ, Debougnoux-Huppertz RM, et al. A pathology-based substrate for target definition in radiosurgery of brain metastases. Int J Radiat Oncol Biol Phys 2006;66:187-94. Shibamoto Y, Baba F, Oda K, Hayashi S, Kokubo M, Ishihara S, et al. Incidence of brain atrophy and decline in mini-mental state examination score after whole-brain radiotherapy in patients with brain metastases: A prospective study. Int J Radiat Oncol Biol Phys 2008;72:1168-73. Tallet AV, Azria D, Barlesi F, Spano JP, Carpentier AF, Gonçalves A, et al. Neurocognitive function impairment after whole brain radiotherapy for brain metastases: Actual assessment. Radiat Oncol 2012;7:77. Pechoux CL, Dhermain F, Besse B. Whole brain radiotherapy in patients with NSCLC and brain metastases. Lancet 2016;388:1960-2. Mulvenna P, Nankivell M, Barton R, Faivre-Finn C, Wilson P, McColl E, et al. Dexamethasone and supportive care with or without whole brain radiotherapy in treating patients with non-small cell lung cancer with brain metastases unsuitable for resection or stereotactic radiotherapy (QUARTZ): Results from a phase 3, non-inferiority, randomised trial. Lancet 2016;388:2004-14. Andrews DW, Scott CB, Sperduto PW, Flanders AE, Gaspar LE, Schell MC, et al. Whole brain radiation therapy with or without stereotactic radiosurgery boost for patients with one to three brain metastases: Phase III results of the RTOG 9508 randomised trial. Lancet 2004;363:1665-72. Churilla TM, Handorf E, Collette S, Collette L, Dong Y, Aizer AA, et al. Whole brain radiotherapy after stereotactic radiosurgery or surgical resection among patients with one to three brain metastases and favorable prognoses: A secondary analysis of EORTC 22952-26001. Ann Oncol 2017;28:2588-94. Lam TC, Sahgal A, Chang EL, Lo SS. Stereotactic radiosurgery for multiple brain metastases. Expert Rev Anticancer Ther 2014;14:1153-72. Available from: http://www.aerb.gov.in/images/PDF/Radiotheraphy/List-of-cancer-treatment-centres-licensed-by-AERB.pdf. [Last Log on 2017 Dec 01]. Sanghavi SN, Miranpuri SS, Chappell R, Buatti JM, Sneed PK, Suh JH, et al. 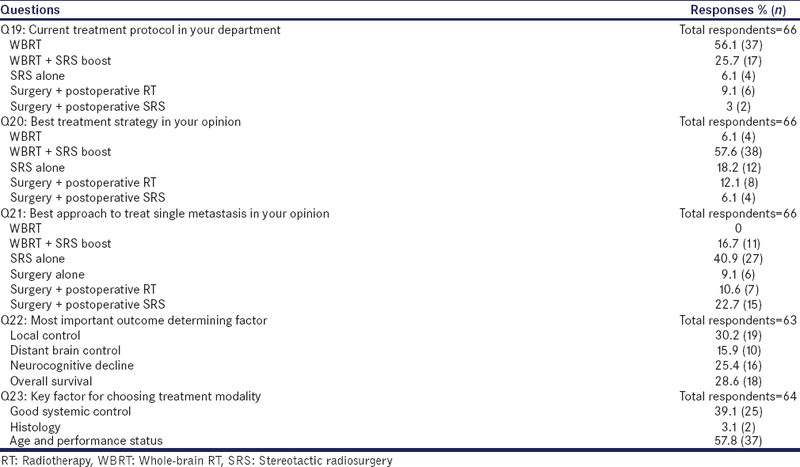 Radiosurgery for patients with brain metastases: A multi-institutional analysis, stratified by the RTOG recursive partitioning analysis method. Int J Radiat Oncol Biol Phys 2001;51:426-34. Sahgal A, Aoyama H, Kocher M, Neupane B, Collette S, Tago M, et al. Phase 3 trials of stereotactic radiosurgery with or without whole-brain radiation therapy for 1 to 4 brain metastases: Individual patient data meta-analysis. Int J Radiat Oncol Biol Phys 2015;91:710-7. Yun GW, Trumbo CW. Comparative response to a survey executed by post, e-mail, & web form. J Compu Mediated Com 2008;2000:6. Rathod S, Munshi A, Agarwal JP. Practice of stereotactic body radiotherapy in a developing country: Perception, aspiration, and limitation – A survey. Indian J Cancer 2016;53:135-7. Stockham AL, Ahluwalia M, Reddy CA, Suh JH, Kumar A, Vogelbaum MA, et al. Results of a questionnaire regarding practice patterns for the diagnosis and treatment of intracranial radiation necrosis after SRS. J Neurooncol 2013;115:469-75.